Uh-oh. Here's a good lesson for the day in the new world of media relations and why you must have -- or must commit to putting into place -- a blogger relations component of your media relations strategy. 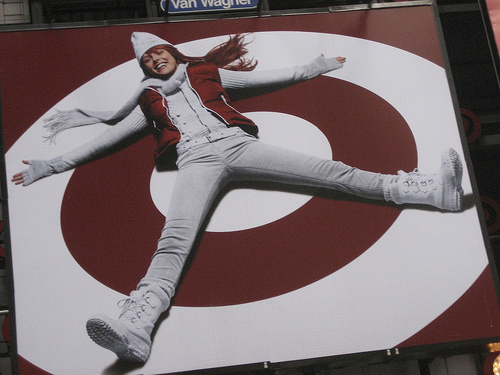 Seems that earlier this month, Amy Jussel, founding director of Shaping Youth, a non-profit blog concerned with media and marketing's impact on kids, complained to Target about a billboard that depicts a young woman with her legs spread laying on top of the Target logo, with her crotch right on top of the logo's bulls' eye. "Unfortunately we are unable to respond to your inquiry because Target does not participate with nontraditional media outlets," a public relations person wrote to ShapingYouth. "This practice," the public relations person added, "is in place to allow us to focus on publications that reach our core guest," as Target refers to its shoppers. "We do not work with bloggers currently," said a company spokeswoman, Amy von Walter, who agreed to speak with this traditional media outlet. "But we have made exceptions," Ms. von Walter said. "And we are reviewing the policy and may adjust it." The Times got wind of Jussel's complaint because the blogosphere did. And I got wind of it because the New York Times wrote a story that was picked up in (among other places) the Daily 'Dog. And THAT is the lesson here -- that we now live in a connected media environment that connects bootstrapping bloggers with the New York Times and then with the world, including "core guests" like me and my family. We are big Target shoppers and even though my wife doesn't spend much time reading blogs, I made sure to tell her about this controversy. Don't be the next Target. Make sure you have in place a blogger relations strategy that allows you to be responsive to what's happening online and to protect your brand. UPDATE: Target gave a brief interview to PRWeek saying that it is now reconsidering its no-blogs policy. Said Amy Von Walter, Target's SVP of Communications: the policy was in place mainly to manage trade media relations, not to limit blogger relations [In other words, Target hadn't gotten the memo that bloggers are as likely to be consumers as trade media, and hadn't done its homework to distinguish which blogs, or types of blogs, it ought to prioritize]. "Our response policy [was] due to the limited number of resources we've had previously--," von Walter said. "We recognize that blogs are increasing in number, and that our core guests," are writing and reading blogs. She added: "We will be reviewing that blog policy going forward. We just don't want to make any decisions we can't follow up on."